Orica, in New South Wales, has been utilising Accuweigh ’s DriveNWeigh in-motion truck scales to weigh and track explosives in its mining operations. 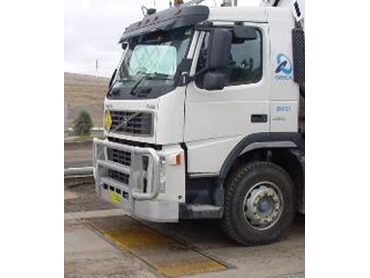 The in-motion truck scales are suitable for weighing trucks at sites like Orica’s Bayswater site where it is too small to install a weighbridge. With the in-motion truck weighing scales installed, trucks moves across the scales at a recommended 10-15KPH. The DriveNWeigh scales measure each axle of the truck in turn as they move over the scales without stopping. The weight of each individual axle along with total vehicle weight is recorded and displayed. The weights can be saved to computer files and/or printed using the automatic data logger. The in-motion truck scales are designed so that truck drivers can read their axle weights whilst driving their trucks, without the need to stop. The truck weight is clearly visible to truck drivers thanks to the digital weight indicator which displays weight measurements in 40mm yellow digits on a black background. The Accuweigh in-motion truck scales are designed to ensure correct weight loadings with the need for minimal civil works. They are installed with a shallow pit and short 4 metre approach and departure pads. The DriveNWeigh truck scales demonstrate a consistent accuracy, to within 100kg, for 42t+ total truck weights. The Accuweigh’s in-motion truck axle scales are very versatile in application. They are ideally suited to ensure that maximum legal loadings have been achieved prior to weighing out on a certified weighbridge through pre-weighing trucks before they leave loading areas.